The Relief and Drainage Map is a pseudo-3D representaion of the Digital Elevation Model (DEM) overlayed with the river system. This is used to analyze the direction of flow of water in a specific location. This is a hillshading application to the DEM which was downloaded from the National Aeronautics and Space Administration (NASA) – Jet Propulsion Laboratory (JPL) website. 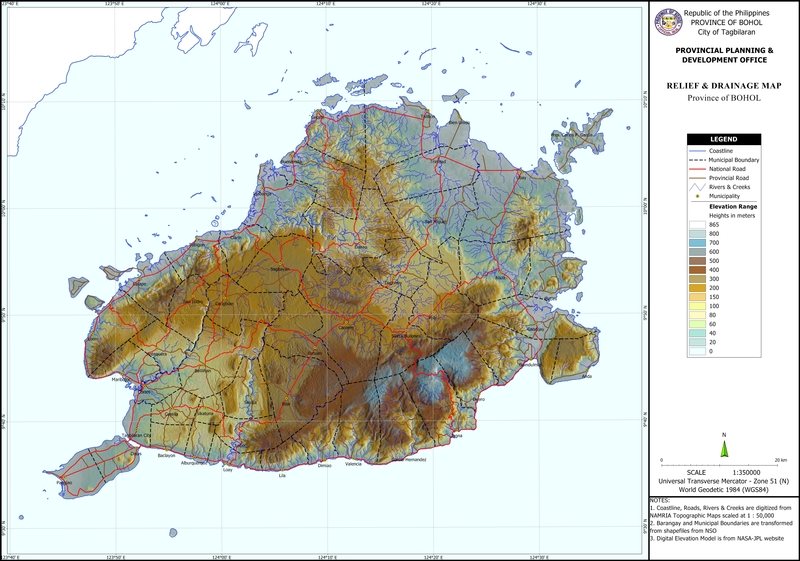 Other map features is from the Base Map digitized from the National Mapping and Resource Information Authority (NAMRIA) Topographic Map sheets scaled at 1:50,000 using heads-up digitizing method. Thanks Melina, but we are a government institution and does not need to boost traffic unlike commercial websites. We focus on putting up information for planners and other interested parties or individuals to be able to access our data that they may use for development planning and other activities for the development of the Province of Bohol.